The Gear Shift Indicator (GSI) supports you to obtain optimum fuel economy and smooth driving. It displays the selected gear position in the instrument cluster as well as notifies the driver to change to the most suitable gear position corresponding to the actual driving condition. Do not rely solely on the shift-up/ shift-down recommendations by indications. The actual driving situation might require shift operations different from indication. To avoid the risk of accidents, the road and traffic conditions have to be judged correctly by the driver before shifting. 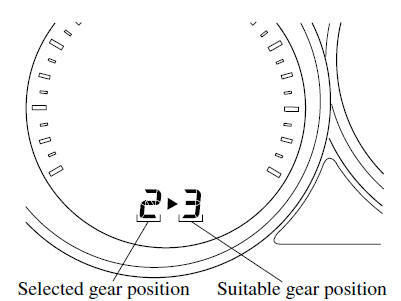 The Gear Shift Indicator (GSI) turns off when the following operations are performed. The vehicle is put in neutral. The vehicle is driven in reverse. The clutch is not fully engaged when accelerating from a stop. The clutch pedal remains depressed for 2 seconds or longer while driving.